Firefighters, including rapellers and smokejumpers, were on the line and en route to Glacier National Park Sunday morning after lightning ignited multiple fires overnight. Three known fires are being fought by firefighters, and other new starts are expected to show themselves as the day heats up. Motorists on Going-to-the-Sun Road can see the Heavens Sake fire burning below Heavens Peak. A crew of rappellers has been requested to fight that fire. A second fire near Numa Ridge will be attacked by smokejumpers. 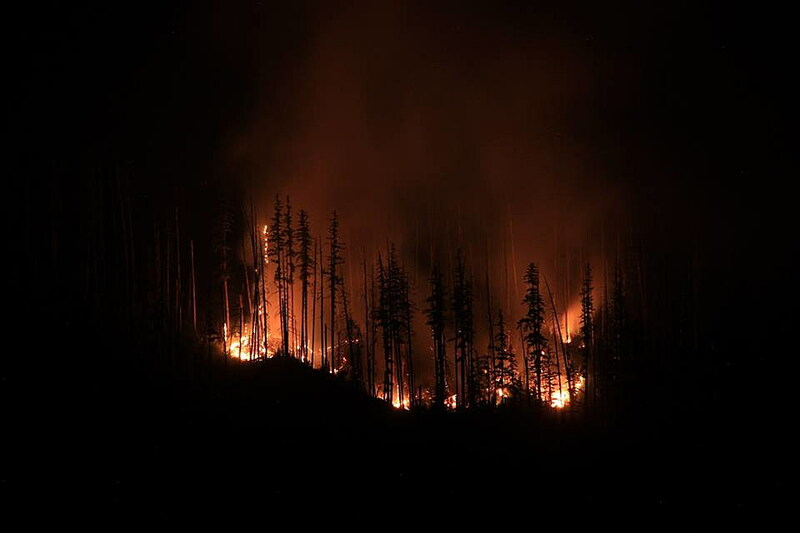 And a fire on Howe Ridge burned actively throughout the night just above the shore of Lake McDonald, according to a report from Glacier Park officials. On Sunday, CL-215s, also known as super scoopers, will pull water from Lake McDonald and drop it on that fire. Ground crews are also hiking into Howe Ridge. The fire is directly across the water from Lake McDonald Lodge, prompting a crowd of visitors to watch its progress from the shore in front of the hotel. Glacier announced the following trail closures necessitated by the new fires: the Numa Lookout trail, Trout Lake trails, and the Howe Ridge and Howe Lake trails. No evacuation orders have been issued for residents who live in the park or for accommodations within the park. There are not yet acreage estimates for the new starts. Glacier Park officials have established a recorded fire information line, which will be updated with the latest news about these and other fires that may emerge: 406-888-7077. Glacier National Park set a heat record on Friday, when temperatures reached 100 degrees in West Glacier and inside the park’s boundaries. Never before had Glacier hit the century mark. Weather conditions continue to be hot and dry, with more of the same in the forecast. A number of other new starts were reported early Sunday in surrounding areas of the Flathead National Forest. The Montana DNRC had an aircraft spotter over the area, searching for the emerging fires.